VLC Media Player is popular among Windows, Mac OSX and Linux users because it allows you to play back virtually any media file without the need to install additional codecs. It's free and open source, and has developed over the years into a very polished piece of software. The one place we didn't expect VLC to pop up was on any of Apple's iOS devices - Apple has traditionally preferred to keep the iPhone, iPod touch and iPad somewhat locked down with regards to the media formats it can play. Consequently it's been hard to get DivX, MKV and FLAC files, to name but a few, to play without first converting them. 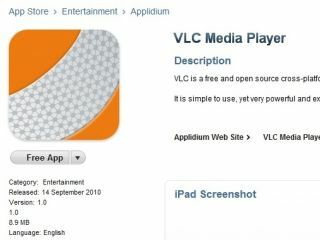 And yet here it is - VLC Media Player on the iPad. We downloaded for free direct from the App store using our iPad's W-Fi connection, although as per the norm you can also do it via 3G or using iTunes if you so wish. It's a speedy download which weighs in at 10MB. To use VLC to play your files, you need to go to iTunes, click the Apps tab, and then in the 'File sharing' section, select VLC and then 'Add'. You can then browse the files on your computer to choose which ones you want to stick on the iPad. You can choose any file format you like, although as we found out, that doesn't mean for a second that they're all guaranteed to play, oh no (if you're an MKV junkie, look away now). Once you've uploaded your files, it's a matter of opening the VLC app on the iPad, and all your files will be waiting for you, neatly lined up on a bookshelf not too dissimilar to the one in Apple's iBooks app. We'll start with the good news. DivX/Xvid files work flawlessly. We tried a variety of different files using these formats and they all worked first time. Skipping through the vidoes is quick and easy, and video quality is bang-on too. There are no video artefacts that aren't present when viewing on a PC, and sound quality is fine too. However, it's not all pink and rosey. Naturally, we also tried a variety of Matroska MKV files - the de facto HD file format of choice among internet dwellers. They showed up in the app well enough - they were even recognised and labelled as HD files - but when attempting to play them we were given the message: "Warning - your iPad is probably too slow to play this movie correctly." You can choose to try to play it anyway, but all the MKV files we tried (at never a higher res than 1280x720) were unwatchable. The audio played mostly ok, but the picture was a mess. So alas, there was to be no playing of The Big Lebowski in 720p - The Dude does not abide. If you pause the video and skip through using the progress bar you can see all the individual frames, so compatibility doesn't seem to be an issue. It seems like the iPad genuinely isn't quick enough to decode the files. Or maybe the app isn't quite efficient enough at harnessing the iPad's A4 processor? We'll probably find that out the answer to that soon enough. There's bad news in other areas too. We tried to use VLC on iPad to play .MPG, .MOV and .WMV files too - they transferred across easy enough, but they didn't even show up in the app. Can it play FLAC files? We were also excited to see if the VLC iPad app would be able to play other media formats like lossless FLAC files. Unlike the desktop version, it can't, we're afraid. Again, our test files didn't even show up in the app, despite transferring over without a hitch. We tested with a 320kbps MP3 file too - that didn't show up either. So it seems pretty clear that the VLC team has had to make some fairly hefty compromises in order to get this app through the approval process. A universal media player this is not - even MP3 and MOV files which the iPad natively supports, do not work in VLC. Still though, the fact that it was approved at all is a good sign. And this is surely the best method yet of getting DivX files playing on the iPad - no more time consuming transcoding. It's just a big shame that MKV playback is so awful - we're sure the A4 chip should be capable of decoding those files. And if you're an iPhone or iPod touch owner looking on with envious eyes, worry not - word is there's an iPhone version of the app on the way, so stay tuned for that one.